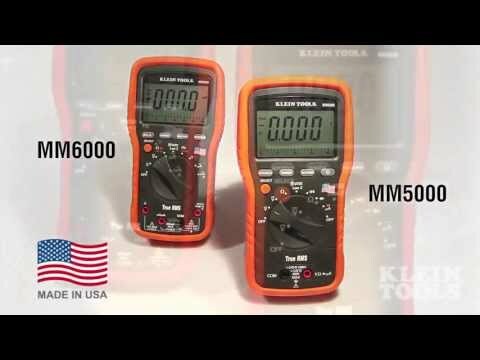 Durable, American-made True RMS Multimeter with NIST Certification for accurate readings of all signals. Auto ranging multimeter measures AC/DC voltage (1000V), AC/DC current (10A) and resistance. Low impedance reduces ghost voltage. µA setting for checking flame sensors. Analog bar graph for fast moving readings. Measures capacitance, frequency, duty cycle, and temperature. Temperature Range: -58~1832 degrees Fahrenheit. Other features include: Data hold, auto hold, range hold, auto ranging, MAX/MIN, relative reading and micro amps. Includes lead warning, low battery indicator, auto power-off, 6000 count back lit display and lead storage. Easy-to-access fuse and battery compartment. Designed for durability: Built to endure a 9.8 ft. (3 m) drop, double insulated and raised rubber molding boot for increased display protection. Included accessories: test leads, batteries, thermocouple and carrying case. Optional accessories: Magnetic hanger (69190), replacement test lead sets (69410 or 69416), carrying case (69401) and replacement fuses (69191 & 69192). The MM6000N is a true RMS HVAC professional meter with NIST cerification that provides more accurate readings for all signals. This multimeter was developed to withstand daily wear and tear on the job site. It is built to endure a ten foot drop and includes a raised rubber boot to protect the display from damage. The meter also has easy-to-access fuse and batteries.